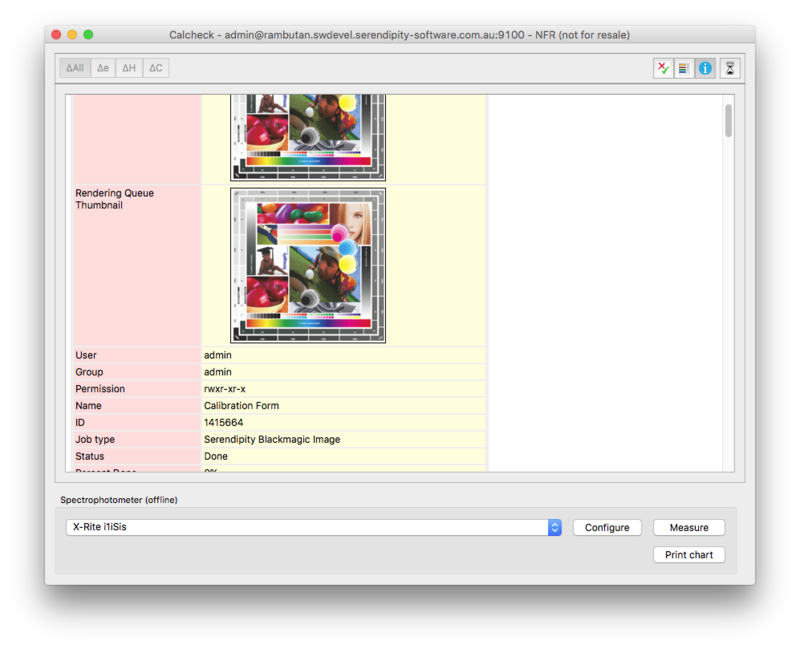 When enabled, all Job and Media Calcheck results are stored in an internal database. The function enables a History button used to view previous results in Calcheck. The database is backed up as part of the Backup Server function accessed via the Server > Help menu. select the Server Settings option from the Serendipity Client > Server menu. tick the Calcheck History checkbox, then OK to close the window. When Calcheck History is enabled, the History Panel can be accessed via the History button at the top right of the Calcheck application window. The panel displays all Job and Media Calcheck results stored in the historical database. Calcheck measurements that passed verification are displayed in green, those that failed are shown in red. Items can be sorted by using any column and listed within a set date range. 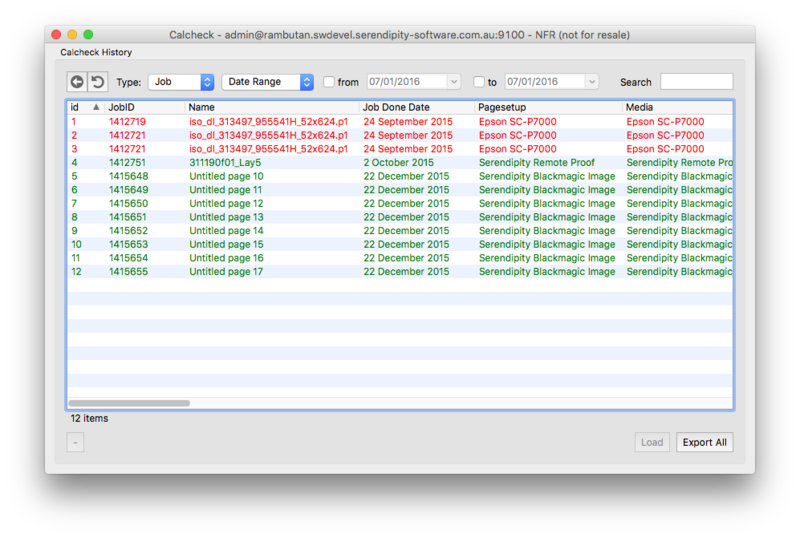 Displayed Calcheck Histories can be exported as .CSV files for use in reporting. Any Job or Media Calcheck history item can be examined in detail by double-clicking on it. The load item’s Summary and Measurement data can be viewed by switching to the respective panels using the buttons at the top-right of the Calcheck window. Additionally, the complete Job Info, or Media details of a loaded history item can be viewed via the Info panel. The Info Panel is accessed via the Info button at the top right of the Calcheck application window. If the job still exists in the Queuemanager, the Imaged and Rendered thumbnails will be displayed with the job info. If a Media is loaded, the relevant details of the Media database item are shown. Refer to the Serendipity Blackmagic / Megarip product manuals for more information on the Calcheck application and Calcheck History functions. This entry was posted in Applications, Blackmagic, Megarip and tagged Version 6.0+. Bookmark the permalink.